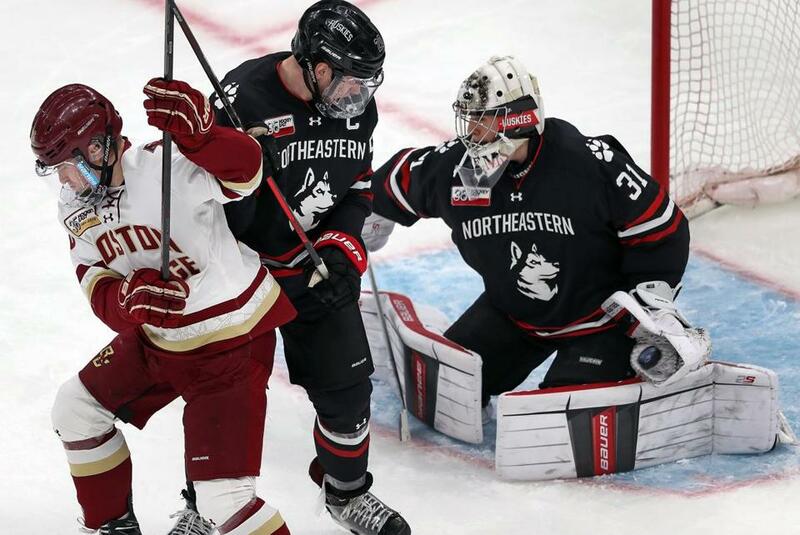 Northeastern held off a furious third-period rally by Boston College to successfully defend its Beanpot title with a 4-2 win Monday night at TD Garden. In the opening-round win over Boston University, it was freshman Tyler Madden that scored the game-winner. In the title game, seniors Austin Plevy, Patrick Schule, and Lincoln Griffin staked the Huskies to a 3-0 lead. Sophomore goalie Cayden Primeau made sure the lead held, recording 33 saves, including 13 in the final period as the Eagles scored twice to pull within 3-2, but could never push across the equalizer. Primeau was named the Eberly winner, given to the goalie with the highest save percentage in the tournament (.952, stopping 59 of 62 shots in two games), as well as the MVP. It’s only the second time the Huskies have won back-to-back Beanpot titles, and the first since in 34 years, when Madigan played on the 1984 and 1985 tournament champions. It was their sixth title overall. 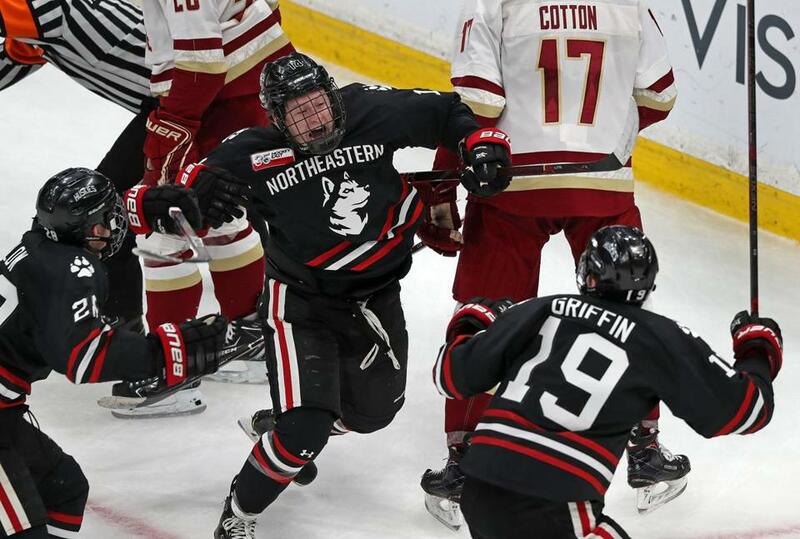 Northeastern (17-9-1) broke a scoreless tie with 38.8 seconds remaining in the first period when Plevy, a transfer from UMass, knocked in a rebound of a shot from Griffin past BC goalie Joe Woll (31 saves). Freshman Jordan Harris was also credited with an assist. The Huskies outshot BC, 14-12, through the first 20 minutes. “A huge game for him,” Madigan said of Plevy. “He’s worked hard. He had a lot of blocked shots today, too. The Huskies were able to expand the lead in the second period, again striking late. Madden carried the puck down the right side, juking a defender before giving the puck up to Matt Thomson, who then circled behind the net and found Schule in front to the left. The senior gathered the puck and held it for a split second, long enough to see Woll go down to his knees, and delivered a wrister that beat the goalie top shelf. It was Schule’s second goal of the tournament. Northeastern outshot the Eagles, 12-8, in the middle period and entered the final 20 minutes with a 26-20 advantage. The lead became 3-0 early in the third when Griffin, a Walpole native, backhanded a rebound of a Liam Pecararo shot past Woll. The Eagles (10-14-3) did not wait long to respond, finally breaking through when freshman Oliver Wahlstrom went behind the net and found David Cotton in front for a quick score to pull BC to within 3-1 with 15:51 left. NU goalie Cayden Primeau made 33 saves in winning tournament MVP honors. “I thought our team really battled back,” said BC coach Jerry York. “I thought we played pretty well in the first and second period, but in the third period, the last 17-18 minutes, I thought we played extremely well. Eight minutes later, BC pulled to within 3-2 when Cotton backhanded a pass from behind the net and found JD Dudek alone in front. Dudek whistled the puck past Primeau with 7:46 left in the game. 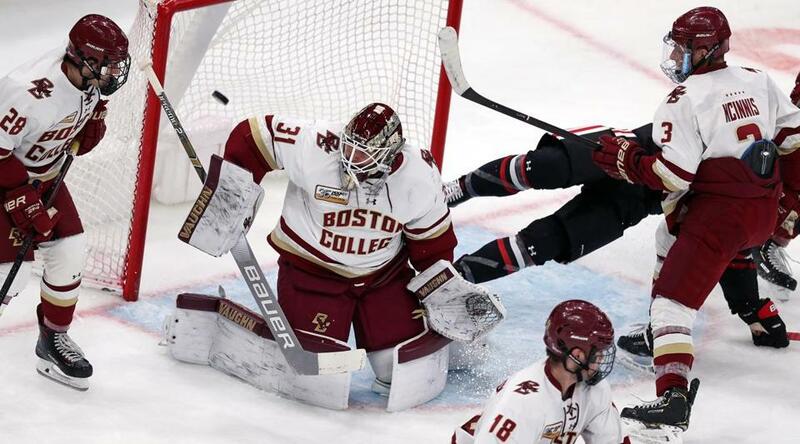 BC's JD Dudek ripped a centering pass past NU goalie Cayden Primeau to cut the deficit to 3-2 in the third. The Eagles had several opportunities to draw even, but Primeau made sure they were unable to cash in. 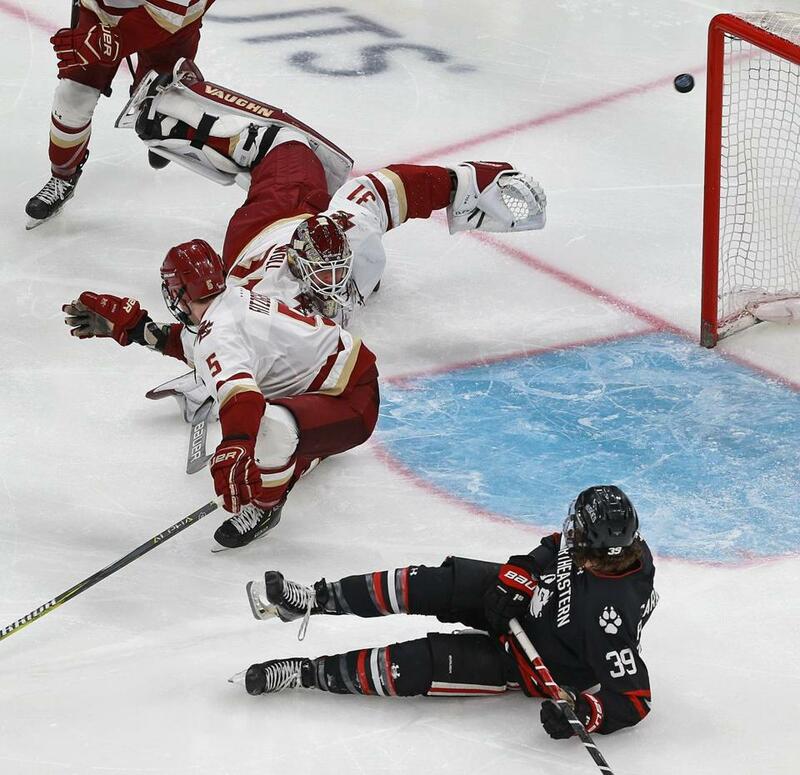 It was not until Zach Solow deposited the puck in the empty next with six seconds remaining that the 14th-ranked Huskies could breathe easy. 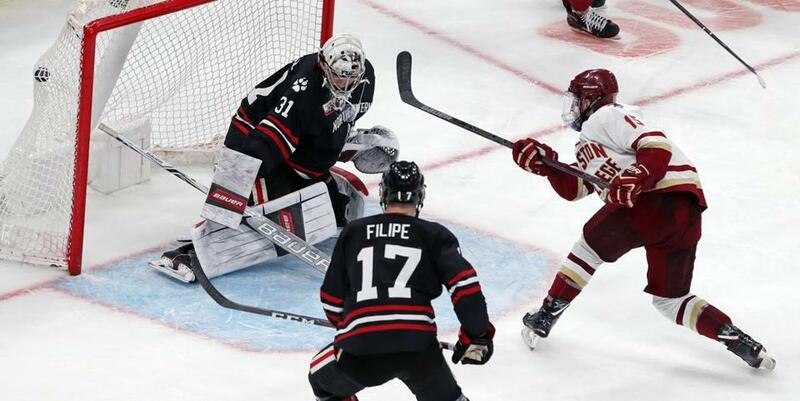 BC appeared to jump out to a 1-0 lead 6:15 into the game, but the goal was waved off after it was ruled that the net was dislodged before the puck crossed the line. The call was reviewed, but not overturned. Northeastern had opportunities of its own, with Biagio Lerario sending a pass across the goal to Grant Jozefek, but he couldn’t control the puck in front of an open net, and the game remained scoreless. Primeau then denied Marc McLaughlin on a rebound, lunging to his right and extending his leg to make a pad save to keep BC off the board. Northeastern went on a power play after Wahlstrom was whistled for slashing 14 seconds into the second period and had several good chances, but Woll was up to the task. Northeastern captain Eric Williams hoists the Beanpot trophy as the Huskies celebrate their sixth title . 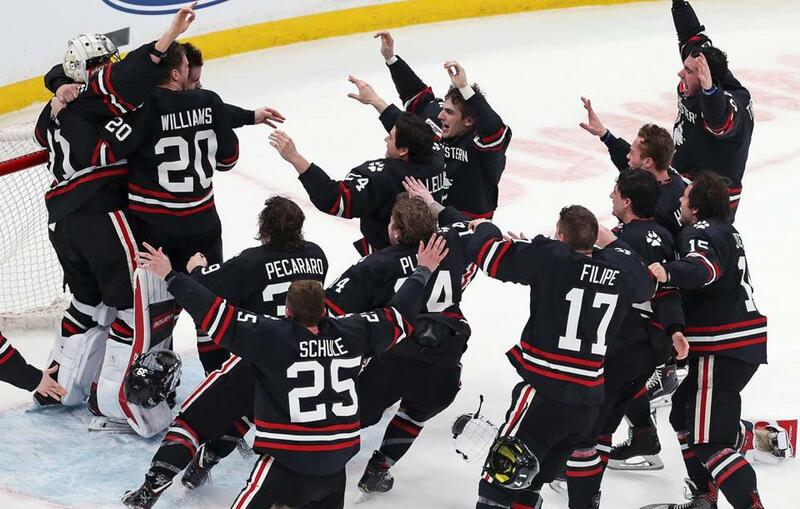 Northeastern players join the celebration with goalie Cayden Primeau after holding off BC. Patrick Schule (not pictured) rifled this shot past BC goalie Joe Woll to put Northeastern up, 2-0. Northeastern's Zach Solow (left) and Patrick Schule rejoice as BC's Oliver Wahlstrom skates off. An out-of-position BC goalie Joseph Woll was unable to stop a goal by Lincoln Griffin (not pictured). Patrick Schule’s goal late in the second period got an enthusiastic response from the Northeastern bench.